Translations missing key elements such as a variable or link could potentially break your website or app. To help prevent this, Transifex automatically checks every translation against a set of conditions. Whenever a condition is not met, e.g. an HTML element is missing, the translator will be shown either a warning or error message telling them what needs to be fixed. Translators can still save a translation when there's a warning. But if there's an error, they'll need to address the issue before they'll be able to save the translation. Each file format has a set of translation checks on by default. You can change whether a failed check results in an error or warning, or turn off a check all together. Go to your Organization Settings from the main navigation. Click on Translation Checks in the left menu. Click on a file format to see the checks available for that file format. Click on the toggles next to each rule to change whether a check should show a warning, error message, or be off. Hit Save to confirm the changes. You can always restore the translation check settings by clicking the Set to default checks next to the Save button. If you use custom variables in your code, you can set up custom translation checks and make sure it’s left untouched in the translation. 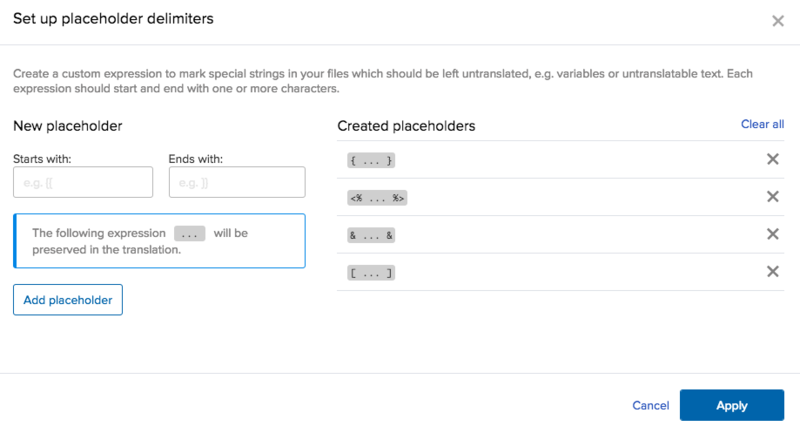 This is done by adding a custom check for a file format, and specifying the characters your custom variables start and end with. 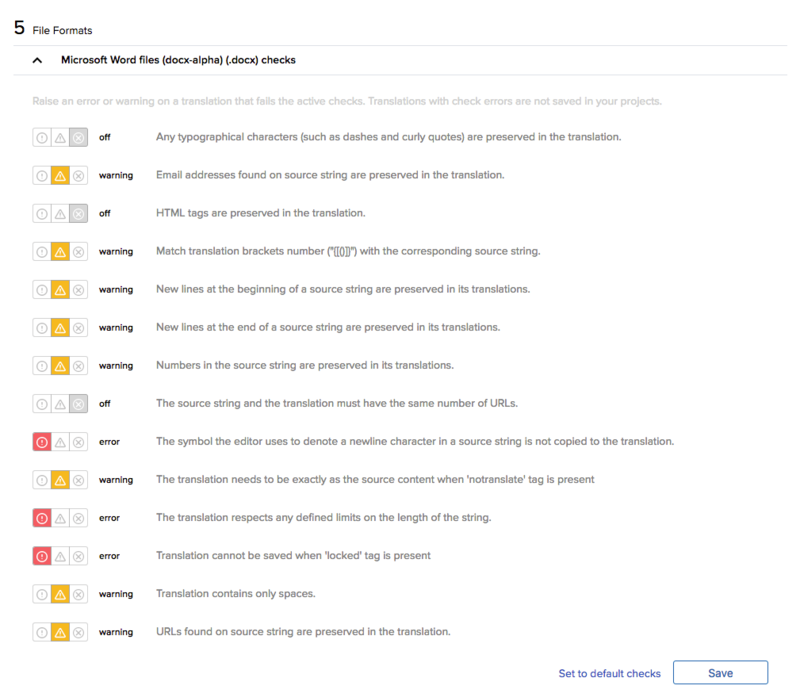 Head to the Translation Checks settings page. Click on the file format you want to add custom checks for. 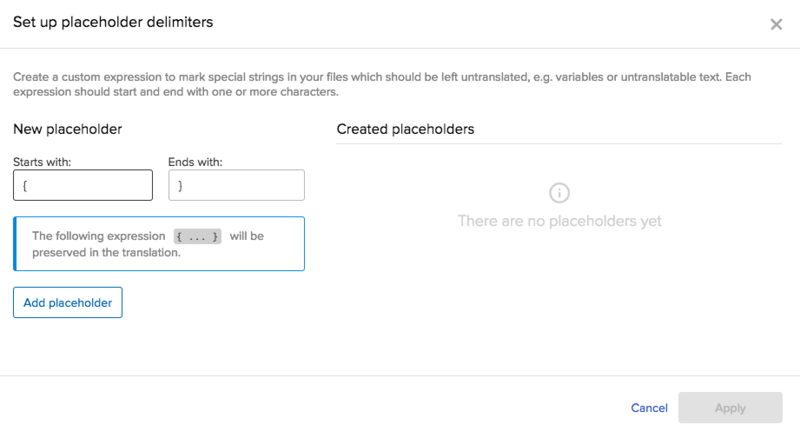 Click Set up placeholder delimiters. In the popup, specify the characters your custom variable starts and ends with. Click Add placeholder so as to finish adding this check. You can add more if you like by creating more placeholders. Like the default checks, you can change whether a failed check results in an error or warning, or turn it off all together.